Oh, I love this card!!! Love the CAS style and the colored leaves! Cute, cute!! Can't wait to work with this sketch! I love your sketches! They're perfect for a quick and cute card! Thanks for sharing your talents! Cute sketch again! 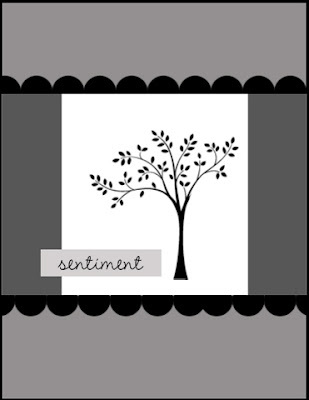 I love your tree card. The colors are just right and I love the patterned paper too. Your sketch helped me out in a pinch for my DT card (which I saved till the very last minute...boo!)...thanks! And I just love your take on the sketch with that tree...one of my fav stamps! Had fun making my card and digging out the old Halloween stamps. thanks for the chance to play. Your card is beautiful, love the colors. Thanks for a fun sketch I really enjoyed your challenge, mine too was used for a DT project for La La Land Crafts! Thanks for another fab sketch Natasha. 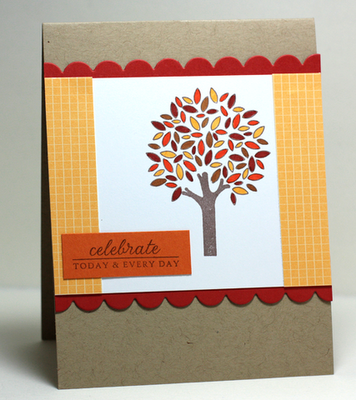 Perfect card for autumn. Fun sketch as usual. Super-fun challenge! I just found your blog, and I'm glad I did. I look forward to more challenges. Another awesome sketch -- it's perfect just the way it's drawn! No tree stamps here, though, so I went with a Halloween theme. What a nice sketch! I love your card! What a wonderful sketch! So glad I was finally able to get to it. Thanks for the inspiration.